it had been a while since i packed for cold weather. but it was exactly what i was wishing for! sayang naman the coats and boots i bought during sales, nabubulok lang in the manila heat and humidity hehe... two weeks before i leave for a trip, i start to monitor the weather of my destination via wunderground.com. i check every day to see if the temps are consistent from day to day, if there is light or heavy rain, if it's windy, if temps drop drastically at night, etc. all these elements come into play when planning my wardrobe. arte ba? well, there's nothing worse than being unprepared, especially if it's colder than you expected! i was invited to tokyo by kérastase to visit their labs and attend a regional press conference for their new product called intialiste (available in may). day 1 was all about the airport, airplane, driving two hours to the lab straight from narita, another two to the hotel, then having 15 minutes to get ready for a press con. so i've got nothing to show for that! i wore a black wool double-breasted knit jacket (vintage from my mom), cotton skirt by forever 21, knee-high leather boots by paul smith, tote by longchamp, and a brocade coat by H&M. 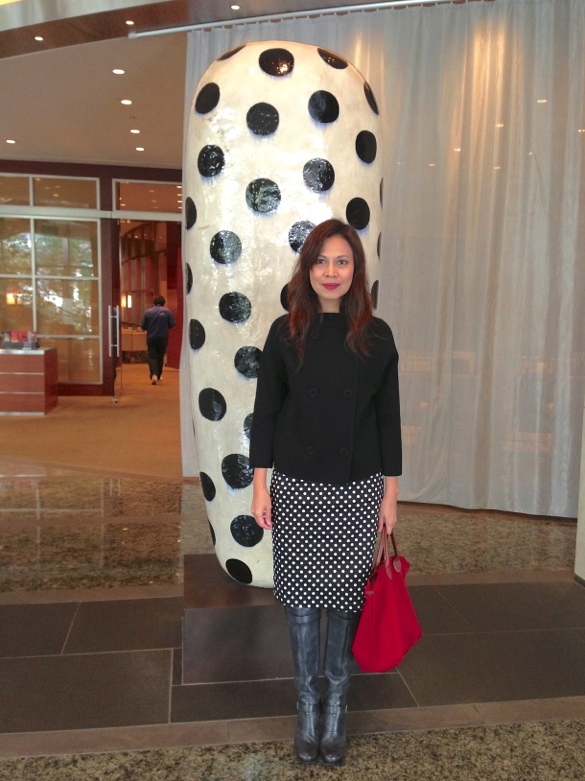 when it got colder in the evening, i added black opaque tights and a muffler, and i buttoned up the coat. those are the little tricks to protect you from the cold and wind: hidden layers (like the double-breasted style, lining in the skirt and jacket, pockets). 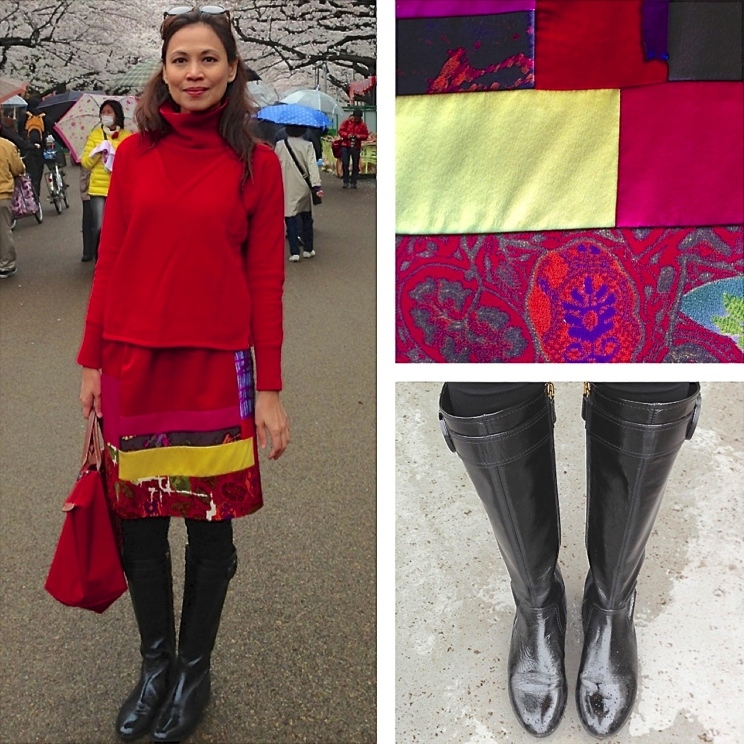 i wore a mock turtleneck from a street market in kaoshiung, taiwan, a skirt by vivienne tam, knee-high flat patent boots by gucci. and this time i added black opaque tights and a tank top underneath. and of course i still had the same H&M coat with me. day 4 was super gloomy and drizzling all day... and biting cold! it must have been around 10-12°C. 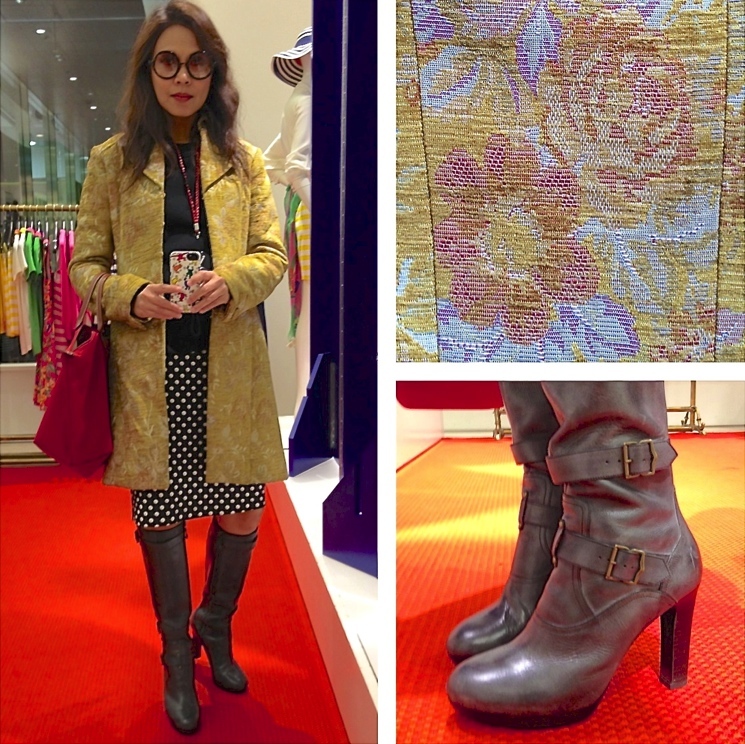 i had planned to switch to a lighter coat today, but i had to stick with the thick brocade coat by H&M. i was picked up at my hotel by a japanese couple, who are friends of the hubby, and they took me around. first stop: ueno park, which has the most number of sakura trees in tokyo. so beautiful!! i wore a thick red cotton turtleneck (vintage from my mom), silk/velvet patchwork skirt by christian lacroix, black leggings (because the skirt was not that thick, so i needed more protection from the cold), the same patent boots by gucci (perfect for the rain), and tote by longchamp (also ideal when it's raining). day 5 it was time to go home huhuhu... i had to leave my hotel at around 745am and walk two blocks to the bus, which would take me to the airport. and it was 8°C eek! so layers that are easy to peel off is key, especially since i was landing in 34-degree temps eek! 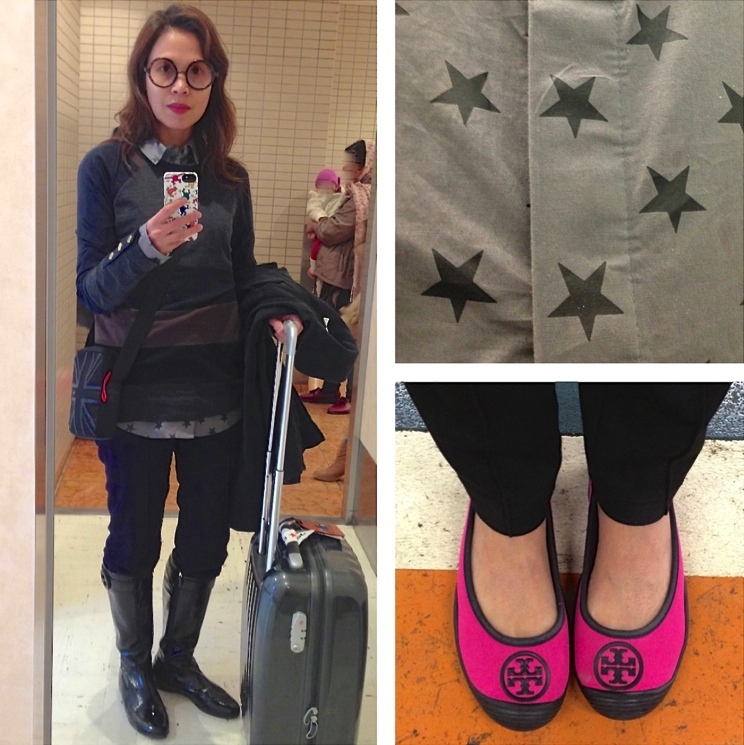 so i wore a long-sleeved men's shirt by folded & hung under a light wool sweater by tory burch, men's stretchy pants by C2 collezione (stretchy is important for long flights), boots by gucci, coat by mango. before i got on the plane, i switched to flats by tory burch. before i landed, i took off the sweater and tied it around my shoulders, and folded the sleeves of the shirt. everything else got packed into the trolley. and i always like to have a hands-free slingbag for easy access to my passport, boarding pass, and wallet. till the fash packs again!